This fantastic student of ArtEz made the audience curious by placing gray-colored blocks (looking like stones) on the runway. Not much later, her models calmly choose their position and kept looked in the audience. Stephanie Baechler used materials as stone, oresa and gems to inspire her in making her collection. Studing geometry and various natural substances, she eventually choose rough woolen fabric lead and turned out to be amazing! A wearable and colorful collection that consists of many trousers and silk blouses. 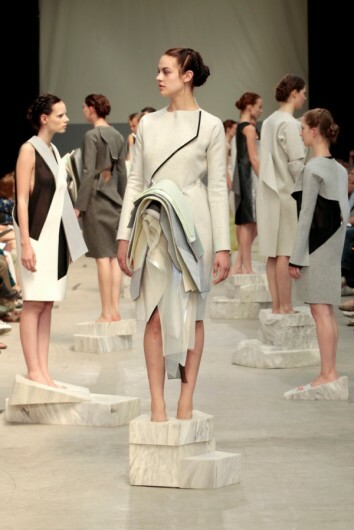 By making her collection Wijnhoud looked at the relationship between individual identity and society. What role does fashion have in the interaction with society and in which way do people choose their fashion identity..
you got to love designers that make a statement and show their true identity. That is what Liselore Frowijn did with her extreem colorful collection of patterns, colors, and materials. Not one piece of fabric is left as it was, the paint dots, squares, diamonds and texts are even drawn in tights.